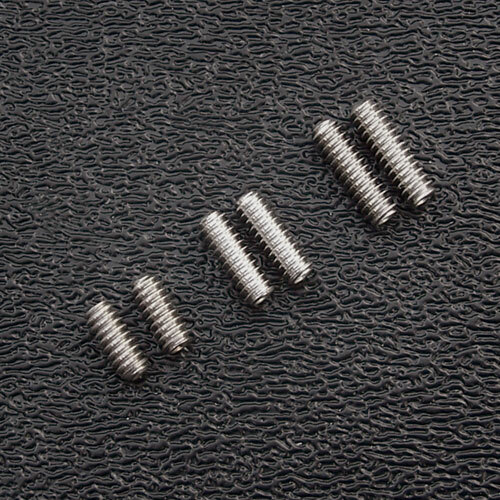 Stainless steel bridge saddle height adjustment screws for the Import Fender® Strat® or similar guitars that use metric M3x.5 threaded saddle height adjustment set screws. Won't rust or corrode. Uses the 1.5 mm adjusting hex wrench which is available here. These little screws are the most often lost screws on any Strat. Lengths: 6mm, 8mm or 10mm. The reason for the 3 different lengths for these saddle height screws is so that you can set the radius of the saddles to closely approximate the radius of your fret board without having excessive length of the set screws protruding above the saddles causing your hand to get caught on while playing. You'll want to keep the excess height of these above the saddle as short or flush as possible. Available in three lengths: 6mm, 8mm and 10mm. All stainless steel metric M3 x 0.5 machine screw threading.